Personality assessments improve understanding of personnel and help managers guide their employees on a path to success. Develop meaningful relationships with employees, and foster a culture they want to remain part of. Find out what you can learn about yourself and your employees. Try an assessment! The McQuaig coaching guide portion of the Word Survey for employee retention and development. Your organization deserves better than a clunky, convoluted traditional 360 that doesn’t make an impact. That’s where we come in, with the McQuaig 360 Leadership Review: an easy-to-use 360-degree feedback tool that’s designed to move you, your leaders, and your entire organization forward. Schedule your free demo today! Provide employees with tools to help them enhance self-awareness, play to their strengths, and manage their areas of development. Empower your team to own their development and set clearly defined goals. 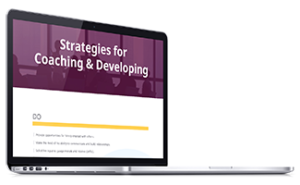 Obtain actionable insight into how to best coach and train employees according to their working and learning preferences. Understand how to adjust your approach to communicate best with your employees and meet them where they are. Identify opportunities for promotion using natural skills as a piece of the puzzle. Determine what employees may need to succeed in higher roles and develop those skills accordingly.